The elementary reaction in which just one molecule or a radical reacts is termed as the Unimolecular reaction. The Unimolecular reaction is an elementary reaction in which just one molecule or a radical reacts. The Unimolecular reactions obey first order kinetics. A number of gas phase reactions obey first order kinetics. Such reactions are supposed to carry on via Unimolecular rate-determining step. Though how does the reactant molecule acquire the activation energy? The activation energy is the minimum energy required for the reactant molecules to react and result products. If the molecules acquire their activation energy via collisions, it is hard to describe first order kinetics. A collision procedure requires at least two molecules and therefore, second order kinetics could be expected however not first order kinetics. In the year 1992, Lindemann and Hinshelwood introduced a mechanism which could describe the Unimolecular reactions in which molecules acquire their activation energy via collision. Suppose two molecules of the reactant gas (X) collide resulting an activate molecule (X*) and a normal molecule (X). Such a collision is known as an activating collision. a) X* can experience collision by the other molecule X and lose its surplus energy. Such kind of collision is known as a deactivating collision. b) On the other hand, if X* can decay to result the product, Y. It will be noted that decay of X* is a Unimolecular reaction. Whenever the decay of X* resultant products is the rate-determining step, then the total rate of the reaction is provided by the given expression. In order to deduce the concentration of X*, an active species, in terms of concentrations of reactants (or products) in the ground state, steady-state approximation is utilized. According to this method, it is supposed that a steady-state is reached after a reaction begins in such a way that the concentration of the activated species is more or less a constant and doesn't change with respect to time. According to the steady-state approximation, the concentrations of all reactive intermediates are constant and small throughout the main part of the reaction. From p = cRT or p α c. Therefore, if the pressure of a gas is high, its concentration is high and as a result, there will be big number of collisions. This means that the rate is first order at high pressures. At low pressures, the no. of collisions reduces. This signifies that the activated molecule results the product as soon it is made and there is not much time left for deactivating collision to take place. In another words, the bimolecular formation of X* is the rate-determining step. Moreover, the rate of deactivating collisions is very small as compared to the rate of product formation. Therefore, the reaction obeys the second order kinetics at low pressures. By employing this Lindemann-Hinshelwood theory, we could describe the Unimolecular decomposition of N2O5 at high pressures. The rates of numerous reactions increase with the increase in temperature. Arrhenius stated the given empirical relationship between the rate constant, 'k', and temperature, 'T'. Here 'A' is termed as the Arrhenius factor or frequency factor or pre-exponential factor and 'Ea' is the activation energy. The Activation energy is a threshold energy which the reactant molecules should encompass in order to react. 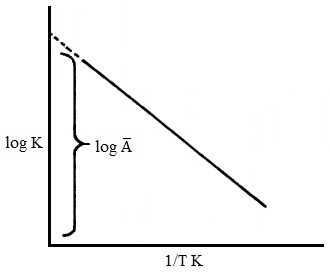 Whenever log k is plotted against 1/T, a straight line (figure shown below) is acquired for numerous reactions. In these cases, the T slope of the line is - Ea/2.303R and the intercept as 1 = 0 provides log A. A feasible reason for the deviation from Arrhenius equation in several reactions is that A and Ea might differ with temperature. The temperature dependence of Arrhenius factor will be illustrated in collision theory. Here, we consider that A and Ea are constant for a reaction. Whenever the activation energy is high for a reaction, it signifies that the temperature dependence of the reaction rate is as well high. In these cases, even a small change of the temperature yields in a large change in rate constant. Collision theory is mainly applicable to bimolecular reactions in gaseous phase. By some modifications, this can be applied to Unimolecular and as well termolecular reactions. We describe collision theory by employing a gas-phase bimolecular elementary reaction of the following. However, the Stearic factor is too to be considered while computing the reaction rate, it will be treated in the refinement of collision theory. Here σX and σY are the diameters of the molecules, X and Y correspondingly. The collision diameter σXY is the distance of closest approach between the molecule of X and molecule of Y. Here kb is the Boltzmann constant (that is, subscript b is added to k to differentiate it from the rate constant), T is temperature and µ is the reduced mass. Here, mX and mY are the masses of one molecule of X and Y, symbolically. c) Let us now compute the factor, (number density) x (number density). As we have two kinds of molecules, X and Y, we have to take number densities of X and Y both. Therefore we have got a relationship helpful in computing the total collision frequency for the collision between each and every molecule of X and each molecule of Y. You should realize that not all collisions between the molecules of X and Y would yield in the product formation. Just those collisions, in which, the energy of the colliding molecules equivalents or exceeds certain critical value Ea (termed as activation energy as per Arrhenius equation), are efficient in bringing regarding the reaction between X and Y. Whenever Ea >>RT, then the Boltzmann factor, e-Ea/RT provides the fraction of the collisions in which the colliding molecules possess energy equivalent to or more than the activation energy. The equation above provides the theoretical value of the rate constant for a bimolecular reaction as per collision theory; π σXY is known as the mean collision cross-section. The activated complex theory or simply the absolute theory of reaction rates shows the formation of activated complex (A‡) from the reactants (X and Y) as a preceding step for the preparation of the product, P.
The reactant molecules come to contact with one other. In this method, some of the bonds get distorted; as few bonds begin forming by the exchange or discharge of atom or groups. The composite molecule so formed from the reactants prior to the formation of the product is known as the activated complex. The activated complex then decomposes to provide the product. The reaction series could be symbolized as represented in the figure shown below. The total potential energy of the system is based in the y-axis and the reaction coordinate in the x-axis. Reaction coordinate is the series of concurrent changes in bond distances and bond angles. These changes result throughout the formation of the products from the reactants. Let consider the reaction between the molecule of H2 and a molecule of I2. To begin with, let us suppose that the two molecules are far apart and the total potential energy of the system is the total sum of the potential energies of H2 and I2. This portion of the reaction course is symbolized via the horizontal part AB of the curve as shown in the figure above. As the two molecules approach one other to such a level that the orbital start to overlap (appoint B in the curve), H-H and I-I bonds start to stretch and H-I bond starts to form. The total potential energy begins rising and this is symbolized by increasing portion of the curve BC. As the extension of H-H and I-I bond breakage and H-I bond formation increase, a point is reached if the potential energy is maximum (point C). The activated complex, symbolized below as a composite molecule, consists of the maximum potential energy. The Activated complex is a configuration of the atoms which the reactant molecules have close to the top of the energy barrier which separates the reactants from the products. Transition state is the highest point in the potential energy curve. The bond-breaking is an energy demanding procedure and the bond-making is an energy discharging process. The total energy need for the formation of the activated complex and its decomposition to products should be available via the translational or the vibrational energy of the reactants. The maxima point in the potential energy curve is known as the transition state. Even a slight distortion of the bonds in the form of compression of H-I bond and stretching of H-H and I-I bonds allows the activated complex pass via the transition state. The path all along CD in the figure shown above symbolizes the course of the events that yield in the complete breakage of H-H and I-I bonds all along by the formation of H-I bond. The horizontal part DE symbolizes the net potential energy of two H-I molecules. However a fraction of the activated complex molecules could form the reactants (all along the path CB) the formation of the products is approximately a certainty, once the activated complex is at the transition state. The fraction of the activated complex transformed to products is known as the transmission coefficient and in the majority of cases, it is unity. Let us now consider the energy criterion for the reaction. The energy need for the reactants to cross the energy barrier is to be met from translational or the vibrational energy of the molecules. At transition state, the activated complex consists of some complex vibration like motion of all atoms. The activated complex consists of one specific mode of vibration all along which it is unstable. Whenever the activated complex vibrates by the frequency corresponding to this vibrational mode, the activated complex decomposes to products. b) The frequency which is being transformed into the product. This is the frequency of one of the vibrational nodes with respect to which the activated complex is not stable.